Best on test – Night Vision	"
The NitSite Wolf RTEK is the first of our products to attach to your day scope. It has an SRP of £799, though a version without audio/video recording capability is £200 less. Sitting between the company’s Viper and Eagle products, the Wolf RTEK gives an in-the-dark range of 300 metres – very useful for spotting rabbits and planning to stalk them. The Wolf RTEK comes in a hard plastic case. Cosseted by foam, the components consist of a combined infrared beamer and 3.5-inch viewing screen, a camera/recording unit, a couple of rubber tubes and plastic attachments, and a battery and charger. A 4GB micro SD card reader are also included. Set-up only takes a minute or two. The IR beamer/screen is attached on top of the scope with one of the plastic ring attachements and the camera/ recording unit fixes to the ocular lens with one of the two rubber tubes. The battery is held in place with a velcro strap and a couple of leads connect everything up. 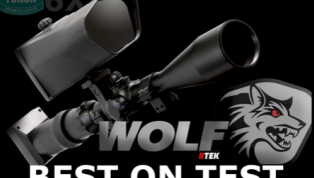 Unlike the other products on test, the Wolf RTEK requires a heads-up shooting position and some kind of support, be it your lap, a bipod or sticks. It sounds awkward, but soon feels natural. A shot in the dark – Rabbit hunting with the ViperRTEK!